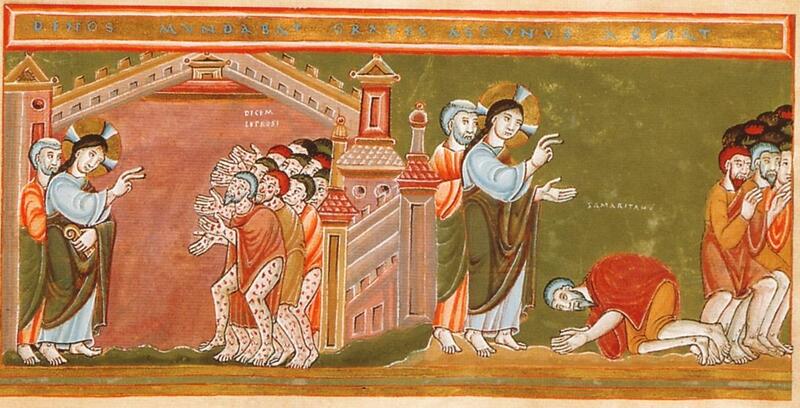 Today, we meet a Samaritan leper—an outsider among outsiders. What can he teach us? St. Luke tells us that as Jesus continued “His journey to Jerusalem, He traveled through Samaria and Galilee.” He was apparently well-known in this region, because “as He was entering a village, ten lepers met Him.” Quite often, Jesus sent some of His followers ahead of Him into a town He wanted to visit to prepare the residents for His arrival. Perhaps when the lepers heard what the disciples had to say about Jesus and the miracles He was working, they recognized an opportunity for them to be healed. “They stood at a distance,” because lepers were ritually unclean, excluded from the Temple and ostracized from Israelite society (see Lev 13:45-46; Num 5:2-3). Only when they recovered and passed Levitical priestly inspection could they be reinstated into Israel’s covenant life. The lepers cried out, “Jesus, Master! Have pity on us!” They got Jesus’ attention. He told them to go show themselves to the priests, a clear indication to them that somehow they were going to be healed. “As they were going they were cleansed.” We have to be impressed that they were willing to do what Jesus told them, even without any visible evidence that He would grant their request. One of the ten, “realizing he had been healed, returned, glorifying God in a loud voice; and he fell at the feet of Jesus and thanked Him.” What makes this man’s behavior particularly noteworthy is that “he was a Samaritan.” We know the Jews hated the Samaritans, and vice versa. Bad blood existed between them for centuries. To the Jews, Samaritans were semi-pagans who had long ago rebelled against the covenant God made with His people. Yet Jesus says about the Samaritan leper, “Has none but this foreigner returned to give thanks to God?” This man becomes an example of how Jesus’ healing gift of salvation will go out to any and all who are willing to receive it through faith: “Stand up and go; your faith has saved you.” St. Luke is always eager in his Gospel to demonstrate that Jesus knew His mission was meant for all people, not just the Jews. Although the other nine lepers were healed of their disease, the Samaritan outsider was also healed of the blindness sin wreaks on all of us. His gratitude for this led him to worship at Jesus’ feet. And so it has been from that day to this. The healing power of the Gospel has now gone out to all the world, making converts in every age and every place. The outsiders have become the family of God. Possible response: Lord Jesus, I want to live in gratitude for Your healing touch in my life. Forgive me for the times I have taken You for granted. Here is an Old Testament antecedent to our Gospel story. Elisha was the young prophet called by God to follow Elijah, who was taken up into heaven at the end of his prophetic work. He, like Elijah, was a miracle worker. Elisha was visited by Namaan, the pagan commander of the army of the king of Syria. He had leprosy; his wife had a little Hebrew maid who had been carried away from Israel as a slave after battle. She urged her mistress to send her husband to see Elisha, who was in Samaria. He went, and Elisha told him to plunge himself into the Jordan “seven times.” Namaan at first was insulted by such an odd response from Elisha, but he finally agreed to submit to it. He, like the lepers in the Gospel, had to obey God’s word before there was any visible sign that he would be healed. When he did, it was almost as if he had been reborn: “His flesh became again like the flesh of a little child, and he was clean of leprosy.” We can see that this foreigner also had a thorough conversion to the God of Israel. His gratitude and worship of the one true God foreshadows the reach of the Gospel everywhere to heal us all of sin (note that it took seven dips into the Jordan to heal Namaan, an anticipation of the seven sacraments Jesus has given the Church to heal the whole world). Here, Namaan, the outsider, becomes an insider in God’s family. Possible response: Heavenly Father, help me obey You in order to be healed, even when it seems like nothing is happening. The epistle gives us an appreciation of what it will cost to spread the Gospel in a world resistant to it. Jesus paid with His life, of course, but He conquered death and rose victorious. Because of this, the apostles He commissioned, including St. Paul, were able to face all the difficulties they, too, would encounter. St. Paul here describes his imprisonment, in which he was “suffering, even to the point of chains, like a criminal.” St. Paul knew that even when he died and was no longer able to preach, others would spread the Gospel to the ends of the earth, for “the word of God is not chained.” St. Paul, apostle to the Gentiles (the outsiders of his day), trusted in God’s plan to reconcile the world to Himself in Christ Jesus. He was not afraid of death. Perseverance and faith are required of us, but the future promised to believers (“we shall live with Him…we shall reign with Him”) makes the cost seem small. Even when we are unfaithful, Jesus remains faithful, “for He cannot deny” Who He is—always, eternally faithful. It is only when we deny Jesus—refuse to believe in Him, refuse to know Him and fall at His feet to worship—that He will likewise deny us. Our denial of Him expresses our desire not to be with Him, and He grants us that. St. Paul never tired of calling outsiders to become insiders, through repentance and conversion to Jesus. Neither should we. Possible response: Lord Jesus, thank You for the power of the Gospel to change our hearts and liberate us. I want to be a witness to this truth for You.